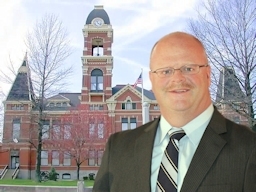 Mike Jansen is the current Campbell County Sheriff serving his first term from 2015 to 2019. Mike has been a professional law enforcement officer for 34 years, serving as a police officer in the cities of Newport, Erlanger, Fort Thomas and for Campbell County Police Department. He also served 5 years as the Commonwealth Detective for the Campbell County Commonwealth’s Attorney Office (CAO). In 2008, he was named Kentucky Crime Prevention Officer of the Year while working for the Fort Thomas Police Department. In addition to his work as a police officer, Mike was a licensed real estate agent for Jansen Realty in Fort Thomas from 1988 to 2015. Mike worked with buyers and sellers of real estate to help them make informed decisions in real-estate transactions. Mike’s experience in these endeavors made him able to take over as Sheriff and hit the ground running. Since being elected Campbell County Sheriff in 2015, Mike’s crowning achievement was receiving the Certificate of Accreditation from the Kentucky Association of Chiefs of Police in the summer of 2017. Accreditation is a progressive and time-proven way of helping institutions evaluate and improve their overall performance. The cornerstone of this strategy lies in the promulgation of standards containing a clear statement of professional objectives. Participating administrators then conduct a thorough analysis to determine how existing operations can be adapted to meet these objectives. When the procedures are in place, a team of independent professionals is assigned to verify that all applicable standards have been successfully implemented. The process culminates with a decision by an authoritative body that the institution is worthy of accreditation. The Kentucky Association of Chiefs of Police Law Enforcement Accreditation Program is one of the most valuable and cost effective ways currently available to departments that wish to enhance overall agency effectiveness and professionalism. Accredited departments benefit from the use of consistent and proven procedures, clearly outlined policies, and efficient practices. In addition, accreditation serves to create a feeling of confidence among your residents that their police department/sheriff office recognizes the importance of establishing and maintaining as high a degree of effectiveness and professionalism as possible. ♦ Provides a means of independent evaluation of agency operations. ♦ Provides a basis to correct deficiencies in the agency’s operations before they become public problems. ♦ Requires that agencies commit policies and procedures to writing. ♦ Provides a norm for an agency to judge its performance. ♦ Has the potential to reduce liability insurance costs. ♦ Promotes accountability among agency personnel and the evenhanded application of policies. ♦ Enhances the reputation of the agency, thereby helping to attract the most qualified candidates for employment. ♦ Minimizes an agency’s exposure to liability, reducing vicarious liability suits. ♦ Builds a stronger defense against lawsuits and citizen complaints. ♦ Increases the community’s confidence in its police/sheriff department. ♦ Recognizes agencies for meeting standards of excellence. ♦ Immediately upon taking office, Mike built a fair-pay matrix for all employees, built a rank structure matrix, negotiated and implemented new health, dental and eye care plans for employees, developed a time-off request procedure (none previous), balanced and made fair employee vacation allotment system, and uniformed all deputies and Court Security Officers in the KY ♦ Sheriff’s Association brown and tan colors. ♦ New design for all Sheriff’s vehicles to be aligned with the KY Sheriff’s Association colors and design. ♦ Developed and implemented a new Policy and Procedure Manual and a set of Standards and Rules of Conduct which was designed to instill integrity and character for the Sheriff’s Office. ♦ Revamped the Sheriff’s website and Facebook page into professional and helpful format. ♦ Developed new software specific to the Sheriff’s Office to improve efficiency of paper service prisoner transportation, CCDW permits and Vehicle Inspections. ♦ Acquired new software to manage the collection of taxes which placed the Sheriff, Clerk and PVA on the same platform. ♦ Returned military surplus rifles that were not being used, sold shotguns not being used and acquired appropriate sheriff patrol rifles. ♦ Created a Drunk, Drugged, Distracted Prevention Driving Education Program for high school students, where the Sheriff’s Office provides an electric vehicle and a deputy to work with local law enforcement to present the driving course to students in Campbell County, and partnered with all local agencies in Campbell County to be an assisting backup agency and mutual aid agency. From 1998 to 2009, Jansen served in many roles in the Fort Thomas Police Department. From 2001-2004, Jansen was the primary investigator for the department, investigating serious criminal offenses reported to the police department. In that role, he laid the groundwork for the city’s membership in Regional Organized Crime Information Center and implemented a computerized case management system. As a Fort Thomas police officer, he coordinated approximately 20 department personnel in the Volunteers of Police Service and coordinated the Citizens Police Academy from 2007 – 2008. He also served as a Community Resource Officer and drafted grants that generated $70,000 to improve the city’s policing effort. During his time in the Fort Thomas Police Department, he received the First Annual Meritorious Award from the Fraternal Order of Police in 2002 and was recognized as a “Hometown Hero” by the Cincinnati Enquirer in 2000 for his community involvement with children. As an officer in the Erlanger Police Department from 1990 to 1998, Jansen established a Neighborhood Watch program in 13 neighborhoods, served as a Crime Prevention Officer and Drug Abuse Resistance Education (D.A.R.E. ), and was a founding member of Kentucky Crime Prevention Coalition. During his time in the Erlanger Police Department, Jansen received the Governor’s 100 Award in Crime Prevention in 1997 by the Governor & Kentucky Crime Prevention Office. He has been a guest instructor in the Criminal Justice Program at Northern Kentucky University. Jansen is a past president of the Kentucky Crime Prevention Coalition, whose mission is to reduce and prevent crime through innovative training and inclusive participation and enhance the quality of life in Kentucky.